Although the congregation is small, we continued to reach out to the community in meaningful ways in 2016. The First Congregational Church of Lyme conducted a Hungry Bag campaign again in the fall resulting in 248 pounds of food to be contributed to the Shoreline Food Pantry at the First Congregational Church of Old Lyme. Once again, the church supported a family in need through the “Adopt A Family” program at Christmas sponsored by the Lyme Youth Service Bureau. Members and friends donated generously to purchase gifts. Our local Meal Center team, comprised of members and friends of the Lyme Congregational Church, and residents of Lyme and nearby towns, continued serving meals at the New London Community Meal Center. We performed this service on the second Sunday of even numbered months (6 times per year). Thank you to all the individuals who donated food and funds, and prepared and served the meals, including set up and clean up. We also had a group represent our church at the annual CROP Walk held in Old Lyme in April. 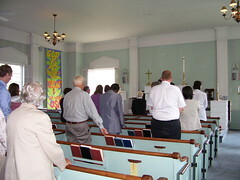 The First Congregational Church of Lyme thanks everyone involved in the year’s outreach activities. We appreciate the continued and generous support of our devoted members, neighbors, and friends.